Devi (Chennai, India) on 28 November 2016 in Landscape & Rural and Portfolio. A tree in the Temple..Wished the moon was behind this..but it was some twenty feet away !!! It is amazing how these can remain in the tree, even if the wind is blowing. It shows that the author knows his stuff. Quel nid et vue et image et captage très douillet. Nice to see the bare branches. @fateme@@: Yes fateme...I suppose the bird has made this strong ! @grouser: waiting would not have help0ed grouser...It would have risen higher up ! A handsome bird's nest, nice photo:-))))Haleja. Happy new weeks my good friend. Always an interesting "reveal" when autumn takes the foliage away from the trees. Great find! Beautiful and big nest ! Fantastic view of the nest and the naked branches. Wonderful capture of your fantastic find. Excellent framing. A fine shot of this nest in its setting. I like it. Great shot! I love it! Best! Great capture of the nest ! A beautiful tangle of branches to support this nest. Great shot, nice to see a few birds in the tree as well. Great shot with or without the moon. :D Is the resident sitting there on the tree, a little bit left from the nest? I can imagine how it looks like with the habitant and the moon. I like the colors. A nice shot of this big nest. A fabulous image. 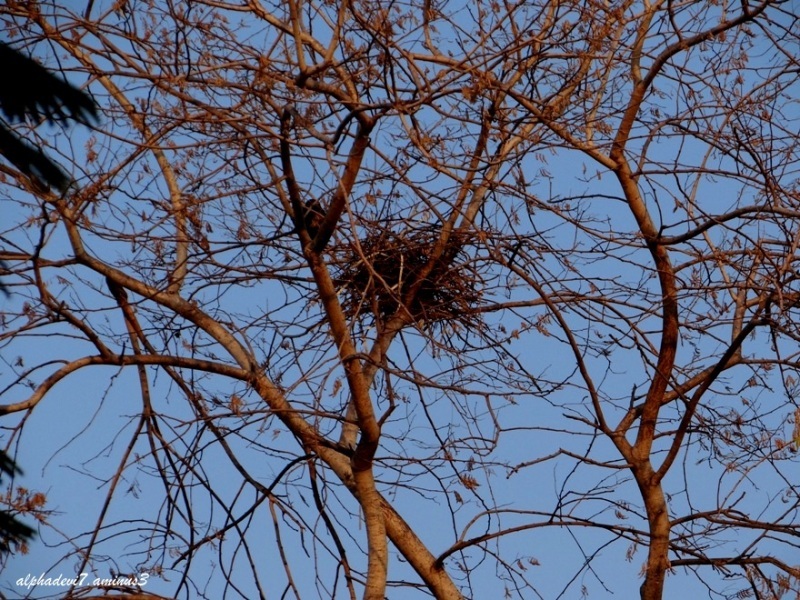 I think that it is amazing how birds build their nests securely in trees. I hope it is more protected than it looks. Nice job using the bland blue sky as a colorful background.